It has been amazing to witness how online video has changed over such a short time. Television has been around for over 82 years. Some churches have included TV ministry as a part of their ministry strategy. While not every church can invest the large amount of money necessary to broadcast on TV, we are now witnessing an era where nearly every church that wants to can have their own broadcast center via the Internet. The basic items needed to do so are a video camera and a way to capture good quality audio. These must be recorded into a digital file that can be transferred to the Internet. This is by far the easiest method for any church. Upload your sermon video to a video hosting service such as Vimeo.com, E-zekiel.TV, or YouTube.com. Once it has been uploaded, get the video embed code and place it on your website. People can now go to your site any time and watch the sermon. Repeat this process each week to make that week's service available online. This is a prerecorded video of your entire service or just the sermon. Note for any strategy: if you include the music part you need to comply with CCLI licensing. This video cannot be watched on demand. Instead, you set a specific day and time for people to come together online. During this online service, you can have a team of servants who serve as greeters to the site visitors. Simulated Live services give more of a sense of community than On Demand does. It takes worship service video from being a one-way broadcast to a multi-directional interaction. While this strategy can give a deeper sense of community, it is also the most technically difficult. This strategy will increase your cost because you will need to partner with a streaming service designed to deliver live video that looks good on all size screens: smartphones, tablets, laptops, desktops, and large HD Televisions. You can combine the strategies above to provide the best strategy for your church. Live and Sim Live: Offer a live stream during your worship service and then have one or more scheduled simulated live services during the week. Live and On Demand: Offer a live stream during your worship service and then make the service available for people to watch any time during the week. Live and Enhanced On Demand: This is the same as the previous, but you could include links to the bulletin, online giving, important announcements for the week, etc. Sim Live and On Demand: This is the only combination that does not really work together. If you offer the services On Demand, there will not be much of an incentive for people to come to a Sim Live service unless you offer something that can only by seen at the Sim Live service. An example of this would be to offer the sermon only as On Demand but offer the entire worship service as Sim Live. 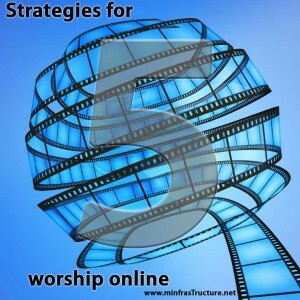 How could online services enhance your church's worship, discipleship, and outreach? What questions do you have about online video streaming?